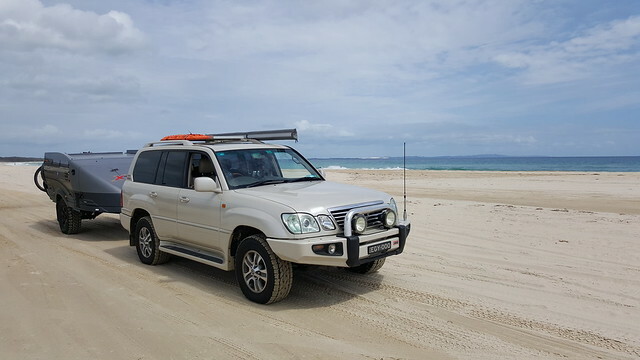 A cruisy, but early get away from the Braemar rest area, saw us on the road with plenty of time to make our ferry across to North Stradbroke Island. We headed up through Casino, Lismore and Bangalow, where I reminisced about my time up in this part of the world as a uni student in Lismore. I still absolutely love this area. So, here we are. Driving north on the M1 west of the GC, excited about getting our ferry across to Stradbroke Island. Old mate (not to be confused with oldmate) in a Commodore comes flying up next to us and motions (in the universal hand circle gesture) to roll down our window. So, we pull off into the first available place, and I jump out, ready to grab the extinguisher. A little perplexed though, as there had been no indication of brakes grabbing, or no visible smoke. ANYWAY, out I get, head down to the back, only to find the rims, and then the brake drums to be stone cold! “Your brakes are on fire! 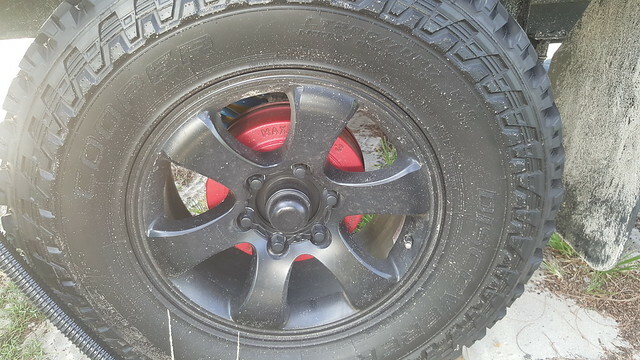 !” – Yes, red brake drums DO look pretty ‘hot’!! Excitement aside, we arrived at the ferry having topped up with fuel pretty early. Fortunately there was space on the next ferry, so we could drive right on and get a head start. Awesome! 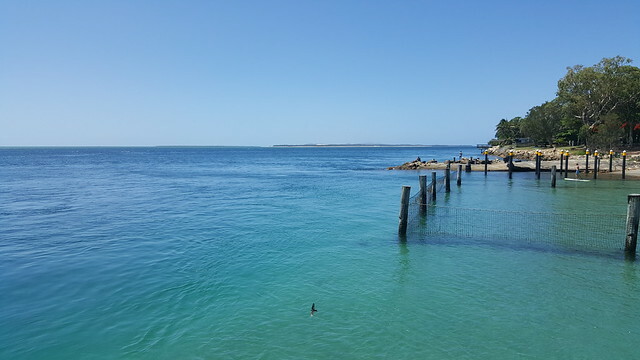 Pole position on the ferry meant that just 45 minutes later we were rolling off onto Stradbroke. 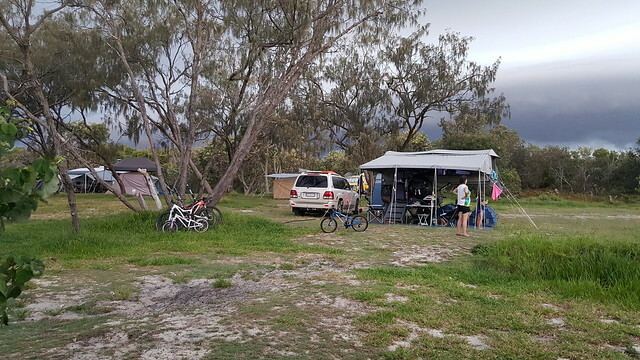 A quick stop at the ‘Straddie Camping’ office to pick up our 4WD and camping passes, and we were heading for the beach. A quick stop to drop tyre pressures on both the car and camper later, we were making our way down the fairly soft sand, trying to work out where we were going and which camp site we wanted. We ended up making our way across to entry 4, and found ourselves a nice quiet spot with amazing views. 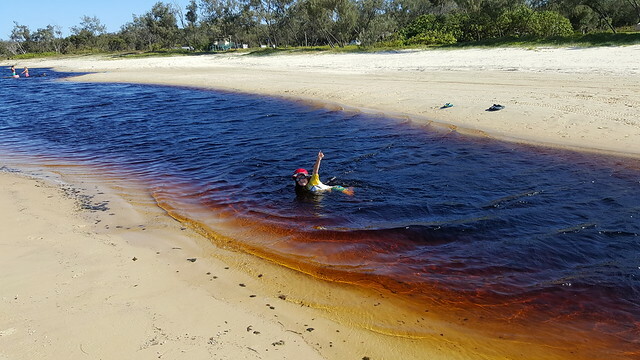 A few people had told us before we left that “there’s no such thing as a bad site” on Straddie, and now we believe them! One of my goals for the trip was to see a Koala in the wild and only 15 minutes after we arrived, that goal was achieved. 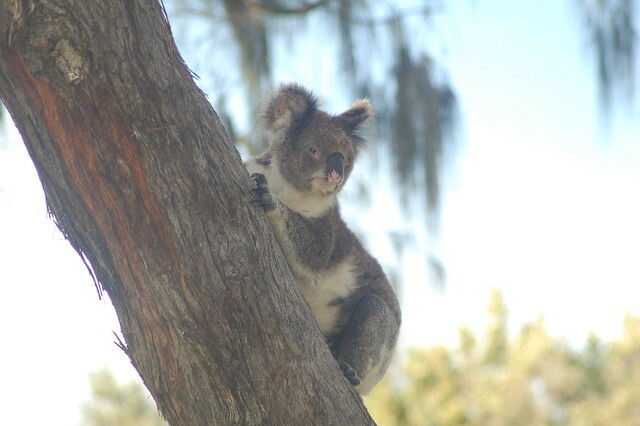 There were a couple of Koalas in trees very near to us. Also later in the week we saw a few more, and had the luxury of lying in bed one morning watching one climb out of the tree and head for the bushes. It was a real treat to have them so close! We’re here for 10 days, so a full setup was called for with the full awning. 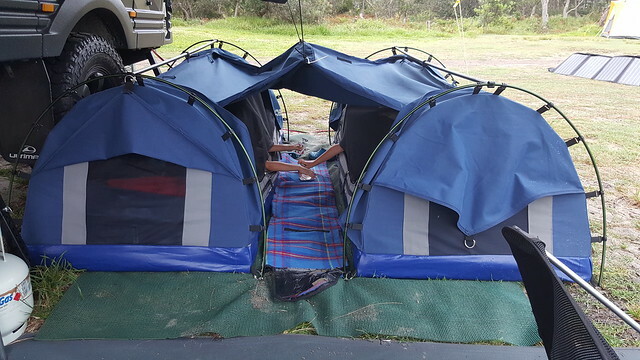 The kids both got swags for Christmas, as an early present, and the plan was for them to be in the swags, inside the spare room, until they were happy (and Mum was happy) to be outside, under our bed. It turned out that this moment came sooner that we anticipated, and they both insisted that they would be just in their swags, without the room. I thought that was awesome… I think Mum is still a little apprehensive! Not a bad spot. 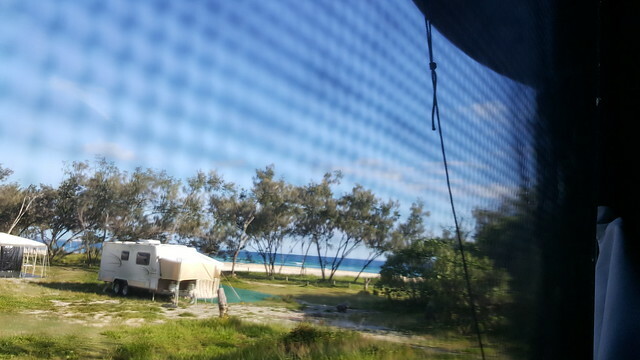 Swags, solar panels, awning… all set up just a stroll from the beach! For the first 5 days, we had amazing weather. Balmy evenings where we were thankful for the breeze coming through the Ultimate Xterra at night, and warm sunny days. We did some looking around the Island, heading up to Point Lookout for some tasty Gelato and probably the best hamburger I’ve ever had for lunch one day. 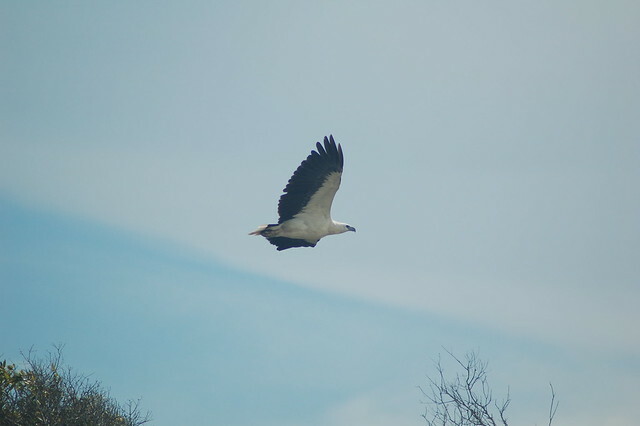 I spotted this beautiful Sea Eagle one afternoon as we were heading down the beach towards our camp site. The last couple of times we’ve used the hot water before this trip it has been a little temperamental to light. We’ve put it down to some strong winds on occasion, and not thought much more of it. One morning it was particularly tough to light – to the point where we went to fire up the gas stove to boil water, only to find the stove less than enthusiastic to light as well. It seemed we were out of gas after about 23 nights. Fortunately, I was able to swap the spare bottle from the BBQ and the hot water fired up without complaint. It will be interesting to see how long the replacement (full) bottle lasts in comparison to the first. It seems as though Flinders Beach is a popular place during the peak holiday season. There are already a large number of groups here that are staying right through until January, some of them for up to 2 months. Some get here early and set up their site (which is often a massive effort) and then head back to work for a couple of weeks – just so they can claim their preferred site. 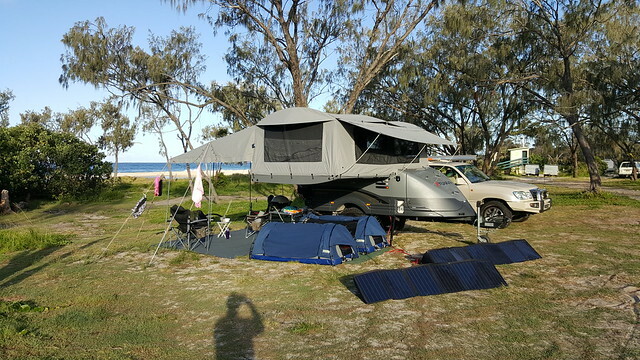 Every second person has a Jayco Expanda, with extra awnings, tarps, gazebos, toilets, showers, cabanas…. you get the picture. (Not to mention the generator that started running for about 14 hours a day, the day before we left!) I think we’ll be leaving at just the right time! The kids have made friends with some children of one of these families, however that has been a little difficult as they now have other friends arriving and Lucas and Ella feel a little like the third wheel. This has been a bit hard for Ella, but spending time with Mum and Dad isn’t QUITE the worst thing in the world just yet. This storm on Thursday night never amounted to much for us, but Main Beach was hammered with hail and wind. Saturday was wet, and cold. It rained pretty much all day which meant some improvisation and inside playing The kids dealt with it really well and had a pretty good time anyway. After 6 perfect days, we couldn’t complain too much about one washout! Rain day over with, the next few days were spent doing a little more exploring, more relaxing, some more swimming, and a lunch at a cafe that we’d rather forget! 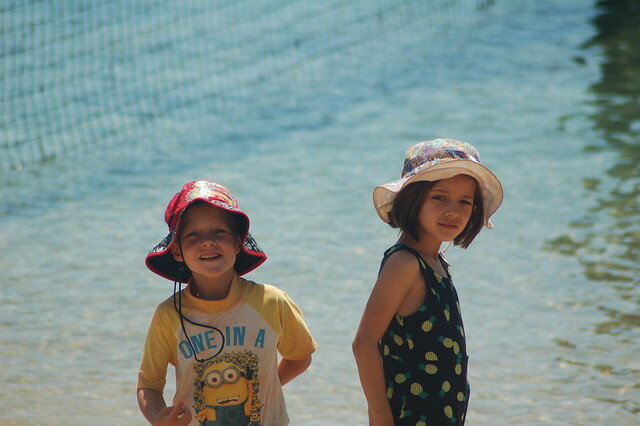 I took the kids for a swim in the surf up at the end of Flinders Beach, were it is very shallow and protected, and they had a ball. Lucas in particular was really getting into it. Have to say that it was a beautiful beach. The water was so warm, and absolutely crystal clear. Just perfect for kids. Monday, however, was a bit of a disaster day. It was decided that we should visit Brown Lake – we made the decision a little late, so had to get moving in order to beat the incoming tide. We threw some things in the car, and headed off… only to arrive at the Lake to discover Ella’s swimmers didn’t make it in the car, so they were left paddling rather than swimming. Back to Dunwich to see whether the Op Shop had a cheap pair we could pick up for the day… only to find it closed on Mondays. Oh well, best have some lunch then. A better idea would have been to NOT sit on an Ant’s nest for lunch. Back to Amity to spot some Dolphins. No Dolphins, but a jack-hammer and closed public toilet. Finally we gave up and returned home… to the sound of that generator! Yep, that’s a “not impressed” look – I really want to be swimming! Before we knew it, our 10 nights on “Straddie” has come to an end. At the beginning of 10 nights, it seems like an eternity, however when you’re somewhere like Flinders Beach, 10 days is nothing. Exactly what we needed to unwind at the end of a busy year. Heading off the beach, packed and ready for the next stop. That said, it is definitely time to move on. Time to discover what else is in store!